Ingenico, a provider of payment solutions, has been selected by McDonald’s Ukraine to implement its contactless payment terminals equipped with NFC technology to provide multi-choice payment options at all McDonald’s restaurants in Ukraine. The Ingenico PIN Pad iPP350 will be used by McDonald’s Ukraine, enabling users to experiment with contactless and mobile phone (NFC) payments. Boasting secure transactions, advanced communication technologies and a plug-and-play installation, this compact retail PIN Pad is designed to speed up transactions while addressing the needs of the customers. 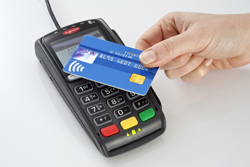 This contactless solution aims to speed up the payment process with an increase ranging up to 30 seconds when using cash or classic magnetic strip line payment card. Furthermore, it will not require the signature capture or a PIN code if the transaction sum is within the set limit. Ingenico will deliver the solution in partnership with JSC “Oschadbank”, one of the largest financial institutions of the country, and JSI “Bancomzvjazok”, the worldwide software development company for secured electronic transactions.